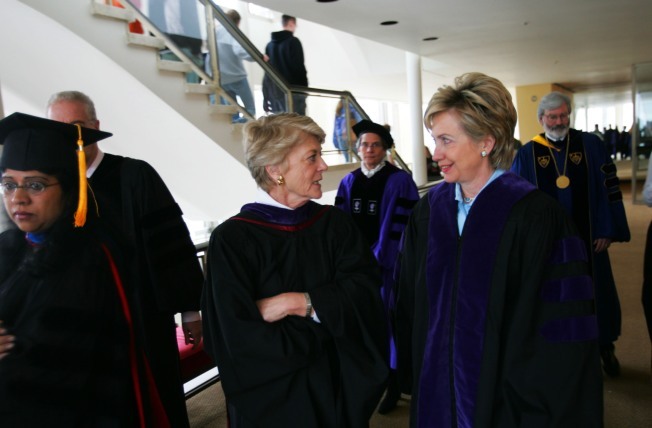 Geraldine Ferraro takes Hillary Clinton to school. Let's recap: A black president-elect, a caribou-cooking loose cannon female governor seemingly marshaling her reserves for 2012, a potential Clinton cabinet appointment (the better half) or 2012 run, and a nation seemingly obsessed with the fact that its first lady-elect chose to wear a dress with a splash of red on election night. A full week since the election, New York Women in Communications convened a lively panel at The New York Times building this morning to review just what it all might mean for gender politics. Geraldine Ferraro (who you'll remember once stood in Palin's shoes — not the red high heels, the vice presidential candidacy) sparred with Arianna Huffington on what journalistic responsibility entails, and Leslie Jane Seymour, the EIC of More magazine, cringingly announced that Miss Alaska would appear on an upcoming cover, and Marie Wilson, president of The White House Project, predicted more women would come to power now that men have had their subprime fun ("Every time there's a mess like this, we get to clean it up"). The belle of the fireball was Ferraro, who confessed she was tired after attending South Pacific last night but didn't seem one bit slowed. She repeatedly referred to the election year that she became the first female vice presidential candidate as "nineteen hundred and eighty-four," which sort of made you feel like she was talking about the year Lincoln freed the slaves. When not cracking jokes like an old school politico ("When you get as old as I am, all you think about is going to Florida and playing golf. "), or saying she wished Tim Russert were still around so she could beat him up a little for his treatment of female candidates, or challenging Huffington on her post-objectivity, Ferraro, like much of the panel, puzzled over Palin. Much of the conversation was reserved for discussion of the Hockey Mom Gov, of course, and Ferraro (a die-hard Hillary supporter) confessed that Palin was sounding a bit more eloquent these days, particularly when she cooked with Matt Lauer. "She spoke very well while doing that," said Ferraro. "They should have given her a pot a long time ago."